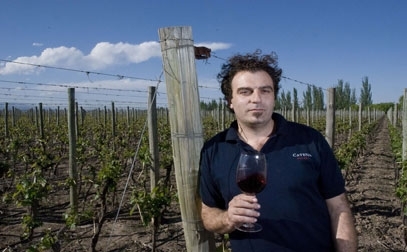 Finding consistency in diversity, that is my philosophy with Malbec and Mendoza. Malbec has certainly found its home in Mendoza. Our high altitude desert oasis offers a multitude of microclimates, with each elevation presenting different growing conditions. When we plant Malbec in various vineyard sites, each one gives us a unique profile of flavors, aromas and textures. Not only do we vinify each one of these vineyards separately, we also conduct various harvest times in each one – usually 3 or 4 different harvest dates from each vineyard. This means that in the winery, I have an extensive array of aromas, flavors, textures and structures of this wonderful varietal. I am like a kid in a candy store – I love to see the incredible diversity on this one varietal from different harvest times and different elevations. From the plum flavors and soft textures of the Angelica vineyard, to the cassis fruit and racy acidity of Nicasia to the full blown concentration, floral aromatics and minerality of the Adrianna vineyard, the subtle complexities of Malbec grown at different altitudes never ceases to amaze me. The blending is the most fun. After appreciating all this diversity, it’s time to slowly but surely bring these components together. Our goal is to create a final blend with a heightened level of complexity. We want each vineyard site and harvest date to lend its unique character, its strength to the final blend. The trick is fine tuning this blend over a series of several months, gently tweaking the percentages to find that seamless blend, that perfectly balanced combination that allows the natural concentration, complexity and balance of our Malbec to shine as it should.